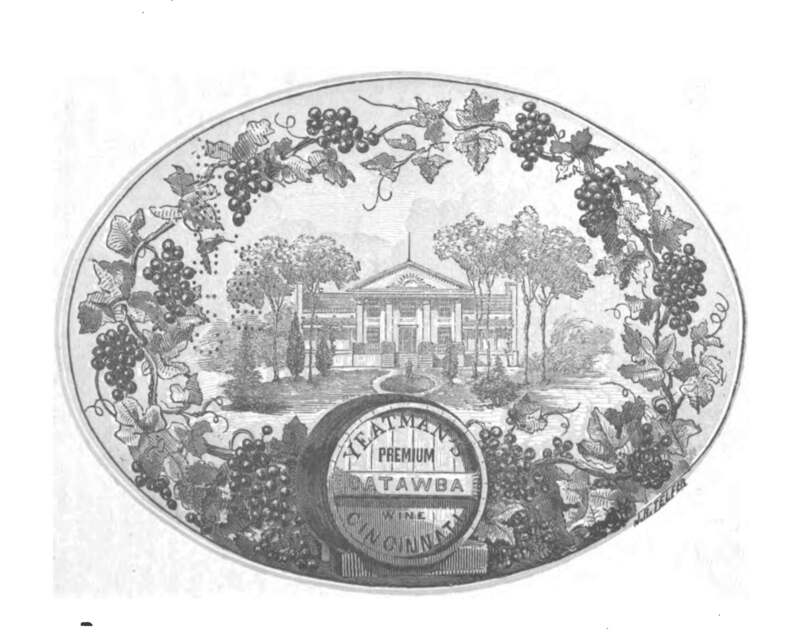 By the 1850s Ohio was the largest wine producing state in the country with the Catawba vine the mostly widely planted. These vines soon began to show disease. In response, the American Wine Growers’ Association of Cincinnati, Ohio set out to find hardier vines that would produce wine just as good as their favorite Catawba. To evaluate experimental lots of wine the Association developed a 100-point wine scale which they first employed in 1853. 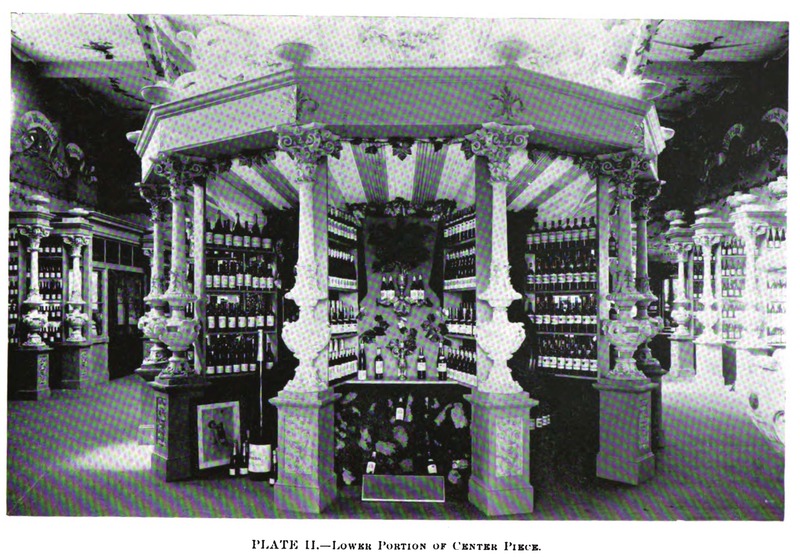 This scale continued to be used by the Association for the rating of all wines through at least 1870. Ohio was not the only state to employ the 100-point scale. The spread of the 100-point scale follows the rise of state horticultural societies interested in the cultivation of vineyards and production of wine. The spread appears particularly active in the 1860s. There was an interest in improving the quality of wine to gain access to the sales market of domestic and foreign wine. The scale facilitated judging committees in picking the top wines from several dozen samples as well as to compare both within and across tastings. Judging committees were typically made up of three to five members. The final score for a wine was simply the average of each judge’s score. The top wines were then those with the highest final score. The scale was actively used by several associations in Missouri. 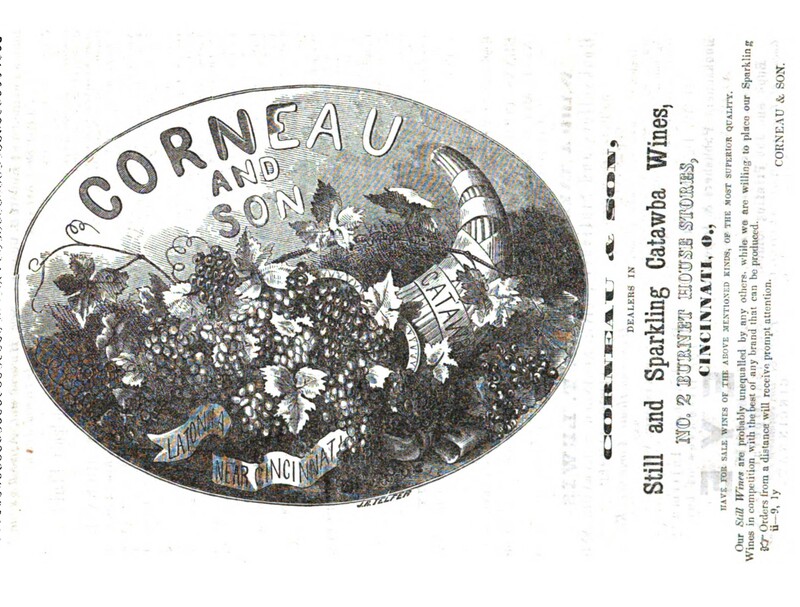 Wines were exhibited at the fourth annual Missouri State Horticultural Society meeting held in January 1863. Though this was the second time wines were showed it appears to be the first in which they were rated. 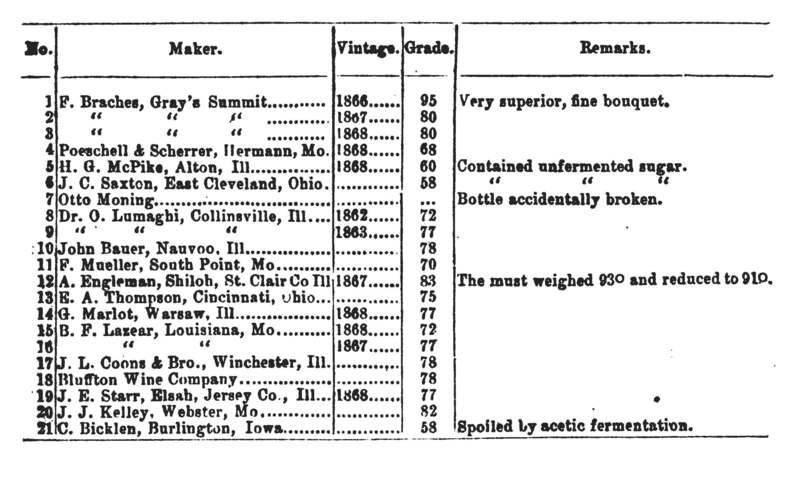 The American Pomological Society held a large exhibition of American wines in St. Louis, Missouri during September, 1867. Not only were their wines from various states but so were the judges. 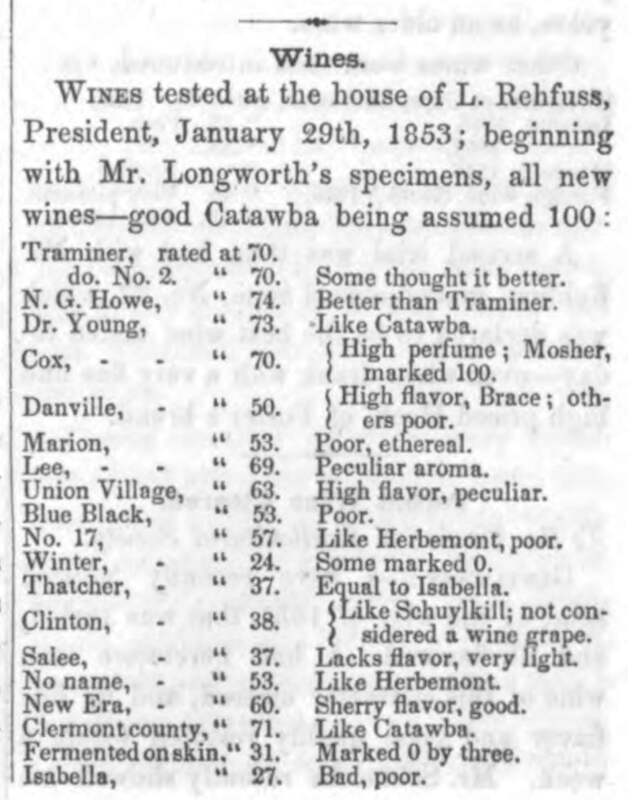 The committee that rated the Catawba wines was composed of two men from Ohio and one from Washington. The 100-point scale continued to be used throughout the 1860s such as by the Mississippi Valley Grape Growers’ Association. In response to a “trying experience at Chicago” the California Board of State Viticultural Commissioners implemented a study to determine the best system for making awards. This study was made by Arpad Haraszthy and implemented for the Midwinter International Exposition held in San Francisco during 1894. The judging requirements were quite thorough with serving temperatures of 60 °F to 65 °F for red wines, 50 °F to 57 °F for white wines, and 40 °F to 50 °F for sparkling wines. The wines were to be judged in a room at 60 °F and tasted out of regulation glasses that were “thin” and “perfectly white”. The bottles were to be presented wrapped in paper with the corks and capsules already removed. Still wines were judged on eight different categories and sparkling wines on ten. For each category “if perfect, would be given 100” otherwise a lower number would be assigned. The points for each category were totaled up then divided by the number of categories resulting in a final score out of 100 points. Amongst the various societies, the 100-point wine scale was applied both uniformly across wine types and also specific to a wine type. The point range itself was also used to different affect. In Ohio the full range of points from 0 through 100 was used. The tasters in Missouri were a bit more practical, perhaps due to tasting bad wine, with “100 being the maximum, or the best wine ever tried, and 50 the minimum. What was under 50 was considered unworthy of mention.” Robert Parker famously employs the 50 to 100 point range in The Wine Advocate. The Missouri comments echo Hugh Johnson’s comparison of Robert Parker’s scale to the “American High School marking system” where “you get 50 points just for showing up”. However, I do not believe the 100-point scale is based on any school marking system. The period of interest was a time of great scientific curiosity about the best practices to cultivate a vineyard, manufacture wine, and determine the composition of wine. For example, the term “wine scale”, meaning hydrometer, appears throughout the 1840s and 1850s in the reports of the American Wine Growers’ Association. Discussions appear obsessive with accounts of must measurements, specific gravity, temperature, sugar, and alcohol. 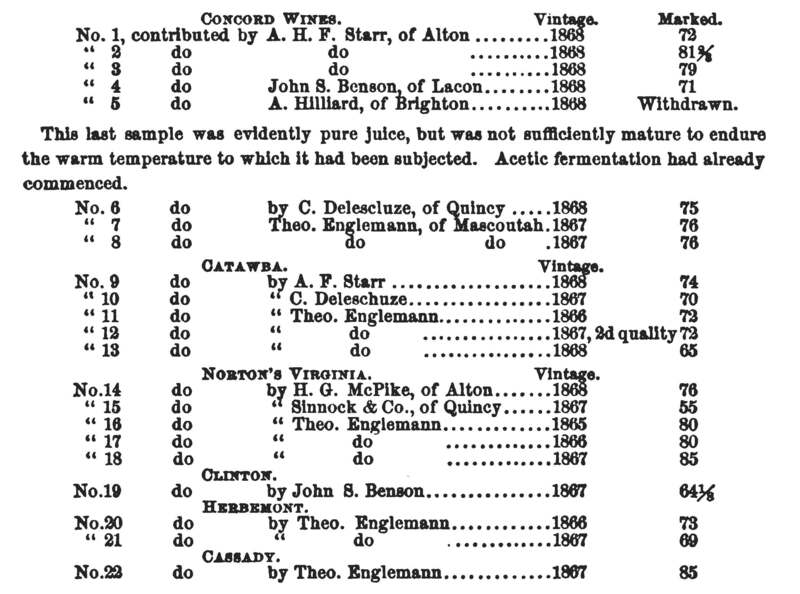 The goal was to produce the best “pure wine” so these measurements were viewed as important. A hydrometer measures the density of the grape must which indicates the level of grape ripeness and sugar content. The sugar level in turn suggests the alcohol level of the finished wine. Wines that were made from the addition of sugar could be ruled out by a committee. The tie between the 100-point scale and the science of the vine and wine needs further exploration. An early, albeit contrary, tie is illustrated in the letters exchanged between John H. Carleton of Arkansas, a vineyard owner and winemaker, with the editor of The Grape Culturist in 1870. The editor went so far as to claim John H. Carleton “confounds Oechsle’s must scale with the imaginary scale of taste of a wine committee”. At the time an Oechsle’s Must-Scale was divided into degrees from 50 to 100 which was the same range of points used to score wine in Missouri.